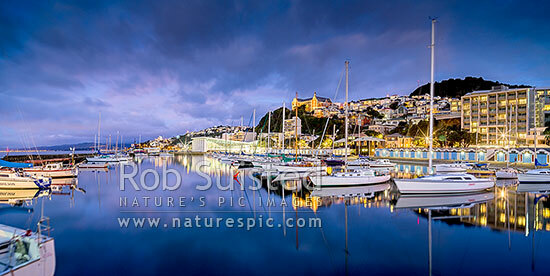 Oriental Bay, Port Nicholson yacht club and boat sheds with St Gerard's Monastery and houses above in Roseneath. Freyberg pool centre. Mount Victoria above. Panorama, Wellington, Wellington City District, Wellington Region, New Zealand (NZ), stock photo.